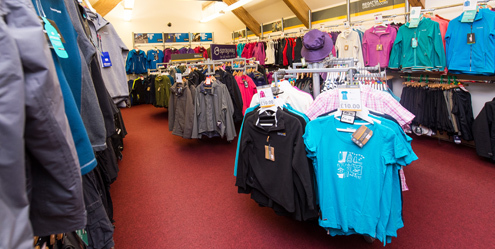 We sell a large selection of outdoor clothing for adults and children. Brands stocked include Regatta, Craghoppers, Dare 2B, Berghaus, Sprayway and Jack Wolfskin. We also sell footwear including Merrells, Berghaus and Regatta, as well as stocking a small range of camping equipment. The business was opened in Feb 2013 by Ros and Phil Hopkinson. Prior to running this shop we ran two shops in Goathland for 28 years and a gift shop in Thornton-le-Dale for 15 years. We pride ourselves in giving a personal, friendly service. Because some of our ranges are bought in large quantities we are able to pass on large savings to the customer. Although from the outside our premises look quite small, we are in fact quite a large shop, often being compared to the ‘Tardis’!